be. Different stakeholders have different perspectives and values of how deer should be interacted with (i.e. What are the historical dimensions of human-deer interaction in Victoria? How is human-deer conflict portrayed in the media and through social media? Abstract Tree hollows are a critical resource for animals worldwide, yet widespread habitat loss has drastically reduced the availability of large trees and tree hollows. Within Australia, tree hollows provide important habitat for more than 15% of vertebrate fauna as well as a rangeof invertebrates. Since these structures take a minimum of 80 years to form, populations of many animals are becoming increasingly reliant on nest boxes and other artificial structures. However, the effectiveness of nest boxes as even a short-term solution to tree hollow availability is questionabledue to short lifespan, high microclimate variation, limited understanding of species requirements, inappropriate nest box design and ongoing maintenance required. In this collaboration between ILWS and CSU Engineering, we will use in-depth knowledge of target species to prototype, field test and manufacture3D printed plastic hollows that are anticipated to have comparable thermal properties, longevity and internal dimensions as natural hollows. How does behaviour influence the survival and fitness of Murray Cod in the Murray-Darling river system? Abstract This project will allow a new interdisciplinary research team to build a track record of innovative research linking individual animal behaviour to local biodiversity challenges. We will address the low rate of survival of juvenile Murray Cod. Juvenile mortality is the major contributor to the current population decline in this species. Animals, including fish, naturally adopt behavioural traits that help balance the need to avoid predation, yet acquire food necessary for growth and survival. These critical behavioural traits for survival are usually considered along a “bold/shy” spectrum. “Bold” traits allow animals to maximise food acquisition but are high risk, whereas “shy” traits reduce predation risk but also reduce food acquisition. 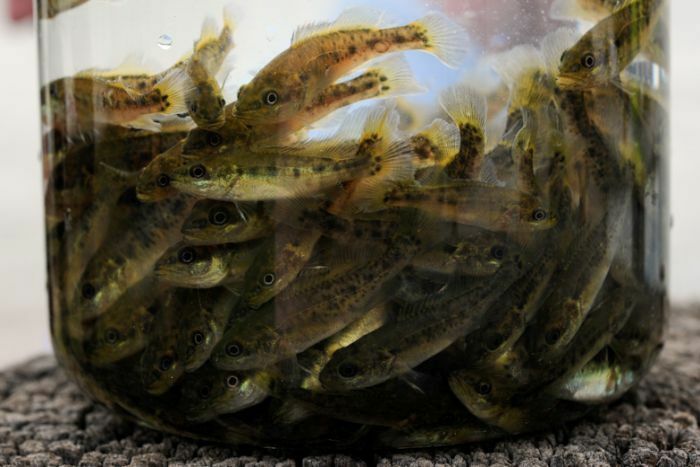 Knowledge gained from this project will 1) inform decision-making on how rivers should be managed to maintain sustainable populations of Murray Cod and 2) contribute to the development of fish hatchery management practices which enhance post-release survival. A study of the biodiversity and abundance of free-living bioluminescent bacteria in coastal waters around Camden Haven and the Camden Haven river. Abstract: Organisms producing light (bioluminescence) are common in nature and bioluminescent bacteria are common flora in the oceans, seas and estuaries of the world. Bioluminescent bacteria maybe biological indicators of water quality and can be free living or associated with marine organisms like fish and squid. To ensure sustainability of water (of oceans and rivers) biodiversity of organisms and their numbers need to be benchmarked for monitoring. Changes in biodiversity including reduction or changes in species can be indicators of changes in populations of predators, pollution or indeed climate change. This preliminary project is aimed at quantifying the abundance and biodiversity of this unique class of microorganism around the beaches and estuary of the Camden Haven River on the Mid North Coast. A survey of the organisms will be conducted by sampling water from beaches around North Haven and Dunbogan and at various locations in the Camden Haven river catchment. 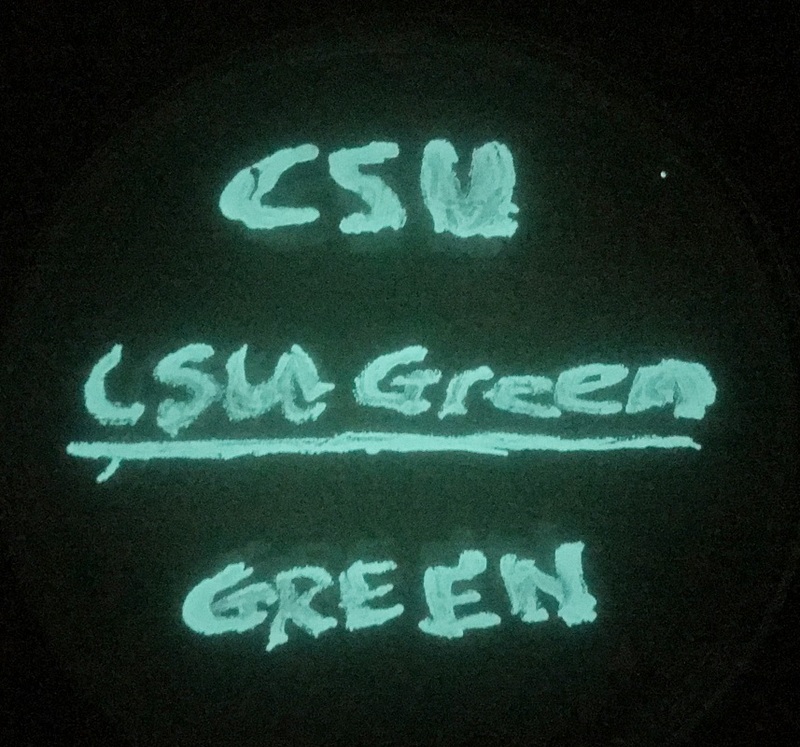 Identification of the species and number of bioluminescent bacteria will conducted using standard microbiological and molecular techniques. Objective: Current work practices in the winery see wines filled, labelled and boxed, then moved to either the Warehouse for storage or to Cellar Door (approx. 200m) where they are then unboxed for use or sale. These boxes are then thrown away, creating unnecessary waste. The pallet sheeting intended to be purchased via this grant is reusable, with an expected life span of at least 15 years. use. The continual re-use of boxes would see them become shabby over time and discarded. These plastic pallet sheets are a much more compact, easily stored and durable, long term solution for continual reuse. Objective: This project will digitise and catalogue a series of historically significant photographs that document the development of the Albury-Wodonga Campus at Thurgoona, covering the period c. 1996-2004.Charles Sturt University's adjunct Professor David Mitchell was instrumentalin supporting the innovative design of the university's Albury. Wodonga campus grounds and buildings at Thurgoona, and in particular the wetlands that enable grey water to be reused on campus. These award-winning wetlands are widely lauded, as is the sustainable design of the campus buildings.Prof Mitchell has a unique and incredibly valuable collection of photographs which date back to the beginning of the campus in 1996. Once digitised and catalogued, these images, along with the oral history already recorded with Prof Mitchell will be available to CSU staff and students, (including as part of the School of Environmental Sciences subjects relating to wetlands management), and the wider community in Albury-Wodonga. Objective: This project builds on CSU Green’s photopoint monitoring work conducted by student Luke Gregory between 2015-17. The aim of this project is to provide 360° video vision that shows a snapshot of vegetation and landscape changes over time (three years) in the conditions the selected points in the CSU Wagga Wagga biodiversity zones. In particular three sites will be chosen at the top, middle and bottom of the catchment to highlight the seasonal changes in the landscape in the middle of summer (Dec-Feb) in contrast to the middle of winter (June-July). Vision will provide vital monitoring evidence over time. There’s potential for this methodology to be replicated on other campuses in an effort to monitor the effectiveness of management strategies in maximising biodiversity values. Objective: The Port Macquarie Campus Environmental Committee in collaboration with the Port Macquarie Sustainability Network (PMHSN) would like to host a Regional Sustainability Expo and Showcase on March 1st and 2nd 2019 at the Port Macquarie Racecourse. The PMHSN is a group composed of local people who champion various aspects of sustainability. The event will be auspiced by Charles Sturt University (CSU). It is supported by the Port Macquarie Hastings Council. We are inviting local and regional organisations and businesses to display at the expo and contribute to conference sessions and workshops throughout the two days on how they are contributing to sustainability. The expo will have multiple themes including Food, Climate, Transport, Social, Land Management and Waste Management. The target audience is the general public and entrance will be by gold coin donation. The Campus Environmental Committee will run the Food and Agriculture part of the expo and play a major role in the organisation and financial management of the rest of the showcase. As a part of food week and to highlight the importance of ensuring that food is sourced as locally and sustainably the Port Macquarie campus environmental committee organised the ‘Sustainable food on the mid-north coast’ conference on the 6th October 2017. Presentations were heard from local council on sustainability, local chefs supporting local producers, local producers, food fermentation and eating for health to engage in ways to add value to local produce. The keynote speaker was Phil Stringer from the Australian Food Sovereignty Alliance, an organisation that lobby’s for support of small farmers. The event raised funds for REAP a regional arm of OZ harvest. OZ harvest distributes surplus quality food from retailers to those that need it within the community. The conference was followed by a food fair where local producers sold produce and talked to the community about their businesses and interests. Around 50 attendees listened to informative talks, enjoyed wholesome foods and learned much about the local food industry. 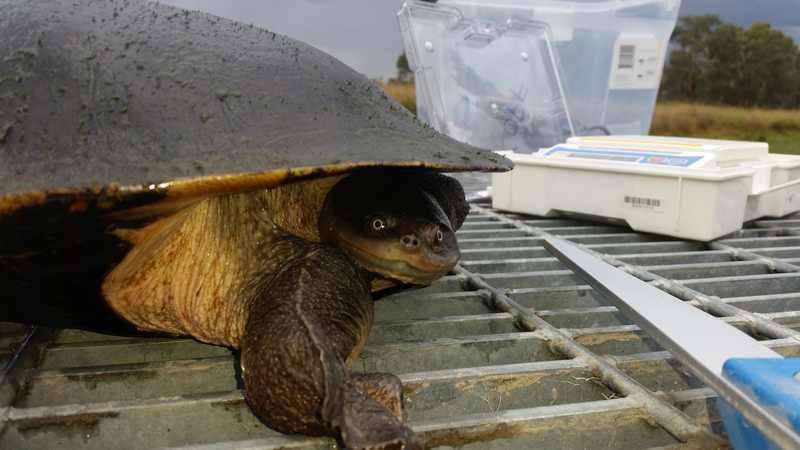 Abstract: The aim of this project was to turn the CSU Albury-Wodonga campus into a centrepiece of turtle conservation, serving as a model for using semi-urbanized wetlands as lifeboats for declining turtles.. 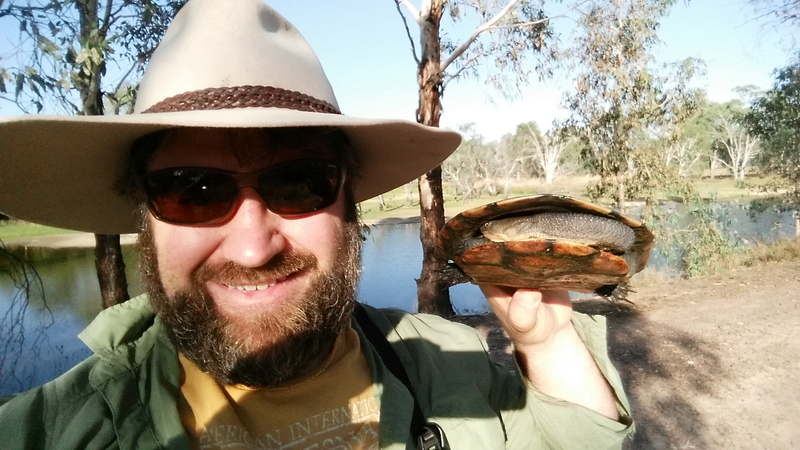 In Australia, about half of the 25 freshwater turtle species are listed by at least one state. In the Murray River, turtle populations are in the process of demographic collapse (Chessman 2011; Van Dyke in review). Nest destruction by foxes is the primary threat and has eliminated recruitment in many populations of Emydura macquarii and Chelodina longicollis for at least 30 years (Thompson, 1983; Spencer et al 2016). Turtles are also threatened by losses of wetland habitat (Ocock et al 2017). We aim to revolutionise the wetlands in Albury-Wodonga to become a pioneering world-class facility for the conservation of threatened species. Outcomes: To our knowledge, this is the first site sampled in the southern Murray River catchment to have both a dense population and a large proportion of juveniles, at least in recent decades. We interpret this as evidence of relatively high recruitment. Although other similar sites may exist in the landscape, the David Mitchell Wetlands may currently be the only “good” turtle population available to compare to, in wider studies of turtle declines in the region. They are thus a valuable resource, both as a scientific “control group” for furthering our understanding of the causes of turtle declines, and as a site worth protecting because it may be one of the few “good” sites left. This project aims to document first-hand customary knowledge of Wiradjuri medicinal plants in a password-protected database. Such knowledge will include the preparation of medicinal plant extracts and the ailments that they treat. In addition, their antimicrobial and antioxidant properties will be explored. Expected outcomes of this project include exchange of skills and knowledge, for cultural and educational benefits, and community capability strengthening. This project will aid preservation and management of customary bush medicine knowledge, aligning with the World Health Organisation’s priority area of maintenance of Indigenous ethnobiological knowledge and the Australian Federal Government’s Biodiversity Conservation Strategy 2010-2030. It will provide Wiradjuri community capability strengthening, and through recognition of the value of their knowledge, empower Wiradjuri people. This project will document Uncle Jimmy Ingram’s concerns for the health of the Murrumbidgee River from his perspective as a Senior Wiradjuri Elder who has spent his life nurtured by the Murrumbidgee dedicated to fulfilling his role as a custodian. The project will be spoken by Uncle Jimmy, sharing his stories and memories. Bernard Sullivan, CSU researcher and award winning film-maker (Yindyamarra Yambuwan) will partner Uncle Jimmy in this project. The direct output will take two forms, a visual book in Uncle Jimmy’s words with Bernard’s illustrations and photos, and a video documentary. The project will raise awareness of environmental issues related to the river and will be an important educational resource in CSU and schools throughout the region. Hawthorndon Creek has been identified as one of the most environmentally important parts of CSU Bathurst campus including remnant native trees which a confined largely to this area. The project increased the native trees in this area to enhance the biodiversity of the area by increasing native tree number and established a wildlife corridor along Hawthorndon Creek between Mount Panorama and Boundary Road Reserve bushland and the Macquarie River. This project is Stage One of a long‐term proposal to engage the student community in sustainable recreation on campus. Stage One entails erecting a bridge and raising low lying areas of existing pathways to make the pathway all weather accessible and adding a series exercise pads for student and community use with equipment made and sourced from campus timbers. The aim of the project is to increase campus users’ and visitors’ awareness and understanding of the campus’ sustainable design features. The campus has an environmentally sensitive design that requires campus users to play an active role in its management. We aim to increase frequency of environmentally responsible behaviours of people who use the campus. At present getting users to play an active role is limited to ad hoc tours and induction processes. A more systematic approach is required if campus users are to: 1). be better oriented and appreciate the sustainable design; and 2) behave in ways consistent with the design. This project will place interpretive signage in key areas around the campus to create a unity of vision between campus design and users and their behaviour. In doing so, we aim to increase users’ awareness and understanding of sustainability and promote responsible environmental behaviour both on and off the campus. This project will install information boards near the campus front entrance to identify the Indigenous Flora and Fauna that use the campus as habitat. Description and detail will include Indigenous names and uses and focus will be on endangered and at risk species. The board will feature colour pictures, detail of each species along with a map that identifies where the most interesting and rare species can be found. These signs will promote biodiversity and encourage campus users to become more aware of the abundant native flora and fauna on the campus. This pilot project will assess the suitability and sustainability of in-ground worm farm composting bins. The project will involve locating five customised bins in key Wagga campus locations: Residences, NaLSH, School of Ag & Wine Science, Sutherland lab Tech staff office gardens. These bins will be monitored by volunteers who will be trained in their optimum performance. Instructions will also be posted on the side of the bins plus QR codes which will direct users and interested people to additional information about the bins. Universities have a responsibility to incorporate sustainability education into their curricula. This study has two key aims, first is to determine if the undergraduate curricula of Australian universities has increasingly focused on sustainability and second to identify the key drivers that have enabled/inhibited this change. The first question will be answered by focusing on 12 professionally focused courses common to most Australian universities across a range of disciplines. The research will use web based content analysis of university handbooks from all 40 Australian universities over 3 five year periods (ie 2007, 2012, 2017) to gain a snapshot of the changes. The second question will be answered using semi-structured interviews of the relevant staff at the universities identified in stage one of this research. The findings will help identify key factors in teaching, human capital, leadership etc that lead to curriculum change. Such research is critical if CSU is to create a curriculum where students develop Yindyamarra. Best methods for sustaining biodiversity within the important production region of the MDB is a prime concern for farmers and natural resource managers. The focus has been on managing native vegetation and providing sufficient environmental water. Soils are an important and overlooked habitat. Macrofauna such as amphibians which burrow and spend many years deep underground provide essential services for soil health, including edaphic and nutrient cycling processes which influence aeration, water dynamics and conditions for root growth. This project aims to find correlations between agricultural production practices, and sustaining soil habitats for macrofauna, particularly the diverse range of burrowing amphibians which occur on private lands throughout the MDB. Testing of soil health characteristics will occur at sites in the Corowa and Holbrook Landcare districts known to contain populations of suitable macrofauna, and interviews with farmers will determine how farming practices sustain both soil health and amphibian populations. Irrigators in southern NSW have increasing uncertainty surrounding water supplies as a result of variable and unpredictable rainfall insitu and reduced catchment rainfall leading to lower inputs into storage dams. There are also increasing demands for environmental water. Historically, irrigated pastured have formed a significant component of irrigated systems and were underpinned by subterranean clover a shallow-rooted species resulting in a significant amount of applied irrigation being lost beyond the root zone. Sub-clover cultivators are also soft-seeded and lack of spring irrigation or breaks in the pasture phase necessitated re-sowing due to reduce seed set and/or low levels of seed reserves. There are, however, a range of new species and cultivators that overcome these deficiencies being both considerably deeper rooted (1-1.6m versus sub-clover 0.5-0.6m) and therefore able to access a greater soil volume; and hard seeded creating a seed bank that will carry-over a number of years. The School of Communication and Creative Industries Wagga Wagga is split across two locations with half of the facilities and staff based in building 76 (car park 51) and the other half based in Building 21 (carpark 5). Several staff members teach across the entire school, and are regularly required to be in both locations, often driving several times each day between the two carparks. This project will reduce the carbon footprint of SCCI staff and promote carbon reduction. Above Murrumbidgee Village, students have access to a vegetable patch/garden equipped with several sheds and a mud brick wood-fire pizza oven. Unfortunately, this whole area has been abandoned for several years, and not only are these beautiful facilities going to waste, but they are deteriorating without care. Our plan is to restore the gardens, plant vegetables, make a small demountable greenhouse over each bed, restore or replace the current mural above the gardens, and make the pizza oven something for students to enjoy during winter, and perhaps place some outdoor furniture in the gardens for relaxing. We intend for the garden to be a comfortable and stimulating environment which encourages a heightened sense of community on campus. This project aims to reduce waste as currently over 1 billion disposable coffee cups are used in Australia each year. By providing willing CSU staff at the Port Macquarie Campus who elect to opt in by making a $5 donation to the CSU’s BeardsOn team, with a reusable “keep cup”. This project aims reduce the number of disposable coffee cups used at the Port Macquarie Campus, as an average of 15 staff using their keep cups once a day over a 40 week period will save 3000 cups going to landfill. This project aims to reduce coffee cup waste as currently over 1 billion disposable coffee cups are used in Australia each year, and so the CSU staff at the Police Academy would be able to play a part to reduce this number. By providing CSU staff who elect to opt in by making a gold coin donation to CSU’s BeardsOn team, with a reusable “keep cup” this project aims to reduce the number of disposable coffee cups used at the Police Academy café. If half the staff buy a coffee a day and use their keep cup the project will save 150 disposable coffee cups a week - over 7000 a year. The Wagga Wagga Campus is positioned between two distinctive hills (the Two Sisters), which form part of the campus biodiversity zones. The Campus Environmental Committee has a vision to establish an eco-walk encompassing both hilltops with a loop track. This will enable engagement with the wider public around the benefits of preserving and enhancing the local biodiversity. We'll promote local Wiradjuri history through the eco-walk name and by telling of the dreamtime story of the Seven Sisters. This project aims to expand on the work done by the Green Corps and CSU Green on Bald Hill (the western Sister) to achieve a simple defined track on the eastern hill. The eco-walk will be accessed via stiles, defined using marker posts, and will incorporate a vantage point and Wagga Experiment Farm's historical ruins from 1897. Interpretive signs will inform walkers about local biodiversity and historical features. The CSU mountain bike trail concept consists of a 950-metre trail connecting the existing crushed rock path network with the Hume and Hovel track. This alignment takes in any available points of interest or treed areas and where possible, avoids possible winter wet spots. The site is relatively flat with a total elevation change of 11 metres. As per the International Mountain Bicycling Association (IMBA) Trail Difficulty Rating System (TDRS) without the construction of technical trail features this loop would fall under the Easy (Green Circle) category. The trail may be used as a bidirectional trail or used in conjunction with the existing crushed rock path network to form a loop. The CampusFlora project at Sydney University demonstrated the power of mobile learning technologies to turn whole campus environments into learning spaces for sustainability. The CSU CampusFlora project will develop an app that will reinforce the core concepts of sustainability for the community using our unique flora. The database will include plant locations, botanical and ethnobotanical information. This will also enhance access to already successful projects such as Orange Campus's Aboriginal Nature and Bioscience Park and the Paths, Walks and Tracks on Wagga Wagga Campus. The power of the app is in its adaptability to offer a range of educational narratives across all CSU campuses, to enhance community awareness of our botanical environment and highlight the cultural significance of our indigenous plants. The vision is for the University community and the community at large to have the opportunity to contribute to our own unique CSU CampusFlora app. Urban areas house half of the world's human population, and by 2050 they will house an additional 2.5 billion people (United Nations, 2014). Urbanisation is a major driver of biodiversity loss globally as it results in the loss of native vegetation (Savard et al., 2000; McKinney, 2002), altered nutrient cycles (Walsh et al., 2005; Grimm et al., 2008), and changes to climate (Arnfield, 2003; Jenerette et al., 2007; Pickett et al., 2011). A key question is therefore how can we ensure that the growth of urban populations has minimal impact on biodiversity? In this project, we will uncover the optimal approach to conserving biodiversity in Australia's growing regional city: Albury. By combining ecological field surveys, ecological modelling, and optimisation of biodiversity indices under current and future scenarios of urban growth, we will reveal the optimal way to grow regional towns like Albury while minimising harm to biodiversity. This project is designed to both critically explore and draw attention to the past and current decisions and actions, which now constitute the built and natural environment of CSU Bathurst Campus and the adjoining Bathurst Agricultural Research Station (BARS). We must urgently consider the capacity for recognition and subsequent adaption, preservation, or destruction of both natural and human-created resources. BARS was recently decommissioned. The project will research communication of the Anthropocene, using these lands as a case study; from original Wiradjuri usage through to agricultural and horticultural experimentation, research and education. Many stories and some remnants remain of significant orchards and buildings, which hosted important experiments and research endeavours. We aim to research, record, and publish layered narratives about activities on these lands, critically framed by the Anthropocene. Hospital waste is treated and placed in landfill with heavy environmental impact. This project will provide the basis for new technology for safe disposal of hospital waste with minimum impact and maximum efficiency. Microwave pyrolysis sterilises and degrades components of waste into products that can be used as a source for energy generation and other uses. For this application, we will observe and measure the types and amounts of materials that go into waste. We'll do this from operating theatres, and through websites and direct contact with manufacturers to investigate the physical and chemical properties of samples of such waste. The next stage (further grant applications including ARC) will use these data to inform the project to test micropyrolised waste by using biochemical/elemental analysis to assess variability, safety and potential use of end products. Once developed, the unit will be installed on site at a hospital, or can be mobile for use in remote areas or at disaster zones. 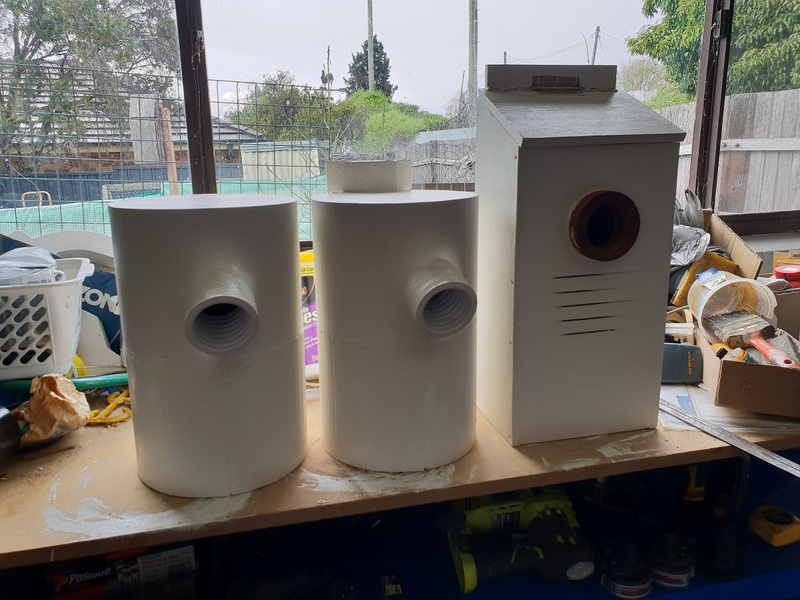 Materials scientists at CSU and UQ will test end products from the waste and determine safe, effective and profitable ways to turn these into saleable and useable products. To provide the cottages of Gobba Village (specifically the area of top Siberia – buildings 381, 383, 385, 387 and 389) and nearby residence of Murrumbidgee Village with a year-round fresh supply of herbs. This audience consists of 34 people in Gobba Village and an additional 15 people from other nearby residences. We aim to grow and develop basic seasonal vegetables that all people can use for day-to-day meals (simply veggies, such as lettuce, tomatoes, cucumbers, etc). We'll also encourage health and wellbeing awareness through the consumption of fresh and healthy produce. A compost system within the nearby cottages will educate people on the value of their 'rubbish' and encourage the idea of communal living and self-sustainability. This compost system will take place in cottages 381, 383, 385, 387 and 389. Synapses is the CSU student magazine produced by students, for students. The magazine is a Writer's Guild publication. The purpose of this green initiative is to ensure that the student magazine is produced sustainably. This will involve initially engaging a local printing company to supply the magazine on quality recycled paper. We will ensure the printing company uses 100% recycled paper to help protect the environment. By using 100% recycled paper, CSU will improve efficiency and reduce waste as recycled paper reduces the amount that goes to landfill. In turn, this reduces the amount of waste produced by CSU. We will promote a green image that communicates trust and responsibility, which will aid the reputation of the CSU student magazine. By supporting a local printing company, we will help to ensure there is an economic and financial benefit for our local community, in terms of jobs and business. Also, by printing locally, we will reduce the cost of producing the student magazine. There will also be no delivery costs. We will develop a strong working relationship with the local printer to ensure a quality green product is produced each month. In the long term, the aim will be to go greener by working toward producing an online Synapses – making it cutting-edge. We will look to fund a student sustainability writer and/or a graphic designer. We will also look to fund a student to assist in building relationships with sustainability-minded businesses in Port Macquarie and to request funding support, sponsorship, and advertising in Synapses. This would allow the system to be self-perpetuating. Purchase t-shirts for staff and students with CSU Green and CSU logo for wearing at initiatives organised by the Campus Environmental Sustainability Committee. Initiatives are Tree Planting Day on 31July and North Shore clean up on 10 September 2016. Purchase 10 litter pickers, five small tree planting shovel or plumbers shovel and 20 pairs of gardening gloves for the North Shore clean up. 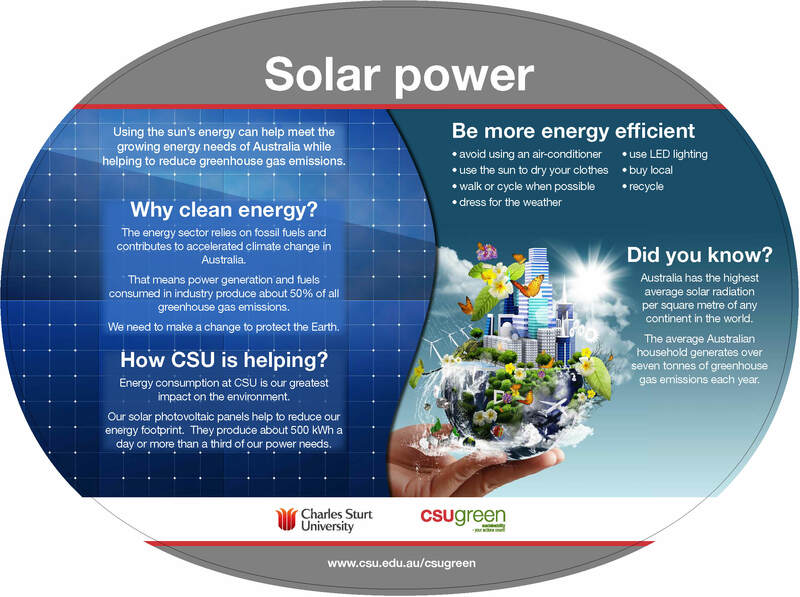 Both these initiatives align with CSU sustainability targets, specifically: 1. Increasing biodiversity (flora and fauna); engaging staff in environmental sustainability; 2. Fostering behavioural change; 4. Promoting social responsibility and wellbeing within the workplace. To develop a strategically aligned, research-informed, commercially viable tool for creating and advancing sustainability foundational knowledge and critical thinking capacity that is adaptable to other organisations and environments. The project consists of three major stages, design, implementation and evaluation structured to fit a 27 month time frame with the key deliverable, tool development, achieved in the first 12 months. The aim of the project is: to cultivate awareness in Faculty teaching staff of how sustainability in the workplace can be incorporated into learning and assessment; to collate and develop resources usable in or across multiple disciplines in the Faculty of Business; to develop examples of assessable learning that incorporate sustainable principles and practices in work related situations in business disciplines. It is intended to use the Green Steps Students Projects and the Sustainable Practice in the Workplace program at CSU as a basis for some of these examples. It is intended to create a collection of plant germplasm primarily native to the Mid North Coast but including other indigenous plants native to other areas on which CSU campuses are based. The plants will include food and medicinal species. Indigenous plant material will be kept as a living collection on the new campus at Port Macquarie in the form of an indigenous plant garden but also as a seed collection and herbarium. 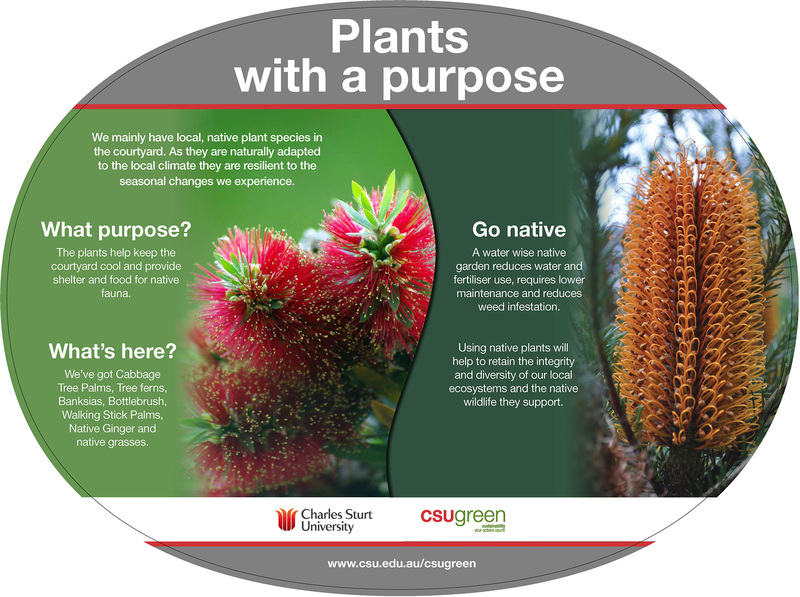 It is intended that plants will be able to be freely accessed by CSU staff, students and the general public for propagation purposes to create other indigenous plant collections on other campuses and elsewhere. Comprehensive ongoing consultation with local indigenous groups and environmental sustainability groups to help source plant material will ensure long-term sustainability of the germplasm bank. This will be a long-term not for profit educational and research resource providing indigenous plants for all. In Australia, at least 300 native vertebrate species (birds, bats, marsupials, reptiles and frogs) use tree hollows (Goldingay and Stevens 2009). Thirty hollows of various sizes per hectare are needed to support a rich mix of species in Australia's woodlands (WMB 1990). Most sites in large blocks of public land have ample regeneration but relatively fewer hollow-bearing trees due to the loss of larger trees (Bennett et al. 1993). Using the simple management practice of attaching hollow logs from limb reduction to other trees will enable CSU Albury to increase its biodiversity and mitigate hollow loss due to remedial tree works. Mistletoes act as a keystone species in Australian woodlands. Mistletoe litter, which is very rich in trace elements, acts to increase insect abundance and quality, which in turn increases bird diversity. Normal mistletoe numbers in undisturbed habitat are about 5 to the hectare. Local increased abundance of mistletoe is often linked to tree stress (soil compaction). Manual removal of some mistletoe from campus trees that are hosting large number of parasites is a short-term solution to prevent tree death. To address some of the underlying causes of large infestations of mistletoe, all mistletoes removed will be mulched and used around large old trees on campus to mitigate some of the stress experienced by these trees near car parks, paths and buildings. Many mistletoes will be retained to provide habitat for the native animals on campus, especially the Critically Endangered Painted Honeyeater which depends on nectar from flowering eucalypts and mistletoe. Sloane's Froglet is a very small, vulnerable frog native to north central Victoria and central western NSW (Knight 2013). The Albury area and CSU Albury are known to have significant populations of this species. Two areas on campus have been identified as locations where habitat enhancement will ensure the continued persistence of this frog on campus—the "frog pond" behind Building 749 and the spoil area behind Building 675. The frog pond area will be planted out with appropriate native riparian vegetation to prevent erosion and silting up of the pond. The spoil area will be spread out and an artificial winter flooding area with riparian vegetation will be created to expand the breeding area for Sloane's Froglet. Funding to rehouse possums on Orange Campus. Installation of possum boxes to safely relocate the possums within 50m of capture into a suitable sheltered position. To reduce building maintenance to roof spaces and provide a clean environment for students, enhancing the student experience. Funding to provide signage of vegetation species and historical context of the conception of the cultural diversity garden at Dubbo Campus so that staff, students and visitors to the campus are informed of the origin and ongoing intention of the space. Funding to research the socio-ecological outcomes of the Kerr Sustainability Centre Community Garden in the context of complex socio-ecological systems (SES) and its implications to sustainability. This project aims to revegetate an area of native grasses within the identified biodiversity zone on Hawthornden Creek and to purchase a fire fighting pump to run a mobile irrigation system to maintain the plant growth. Revegetation in the specified area along Hawthornden Creek is preferable to planting in the area that has been identified in the past. The funding will be used to purchase Wallaby Grass and Oxley Grass seeds. More investigation will be undertaken to determine if the seeds should be sown directly into the site or propagated in the greenhouse and planted as tubestock. A pump is required to get water to the area for irrigation, however, most of the funding will be used for revegetating the identified biodiversity zone on Bathurst Campus. The Boundary Road Landcare Group has also been involved in the decision making as the site abuts the Boundary Road Landcare site. This group grows native grasses and may be able to assist in providing tube stock. This project is designed to replace existing SCCI filament based lighting stock with LED (Light Emitting Diode) units. The units will be installed in Building 1454, Studio 101 and the Ponton Theatre, in a generic rig arrangement. There would be one permanent rig in the theatre, and three in Studio 101 and building 1454, facilitating various performative and learning and teaching needs. The concept is to create accessible, multiple use, authentic spaces that are sustainable in regards to energy use. The spaces will be used by students and academics as part of various components of SCCI curriculum, as well as for the development and undertaking of research work at all levels. Importantly, the live performance industry has a focus on sustainable events and this project aligns us with industry, and the training provided by the SCCI for industry at a core level. This project aims to establish an Aboriginal Nature and Bioscience Park on the CSU Orange Campus. Besides preserving the last area of original remnant vegetation on Campus, we will develop a pool of native plant species local to the Central Tablelands and of cultural significance to Aboriginal people, emphasising the preservation of endangered species. This serves a number of purposes: triple bottom line sustainability, with educational, cultural, community engagement, ecological and biological aspects. The Park will conserve native plant species that have nutritional, medicinal and horticultural potential are unknown or not fully realised. This is an independent part of a multi-faceted approach to increase the educational, research and community engagement profile of Orange Campus, but is central to these endeavours. Thus supports two other projects: the Aboriginal and Torres Strait Pathways Program, our RIBG fund application, and The Wiradjuri Initiative: Mapping the Genetic Diversity and Ecosystem Services of Local Native Flora. Funding to improve the social and garden spaces at the Kerr Sustainability Centre for CSU and community use. Includes final materials for a pizza oven and some railway sleepers for new garden beds. Funding awarded for implementing a worm farm and compost facility at the Murray Children's Centre on the Albury Campus. These facilities will be used to teach pre-school aged children about recycling and good waste management practices. Funding of interactive sustainability learning materials that will be used for 2014 and beyond by the Murray Children's Centre, Albury Campus. Funding materials for pre-school children to use to make items that teach sustainability concepts at Riverina Children's Centre, Wagga Campus. This project aims to create a functioning apiary for staff, students and the wider community to learn about and participate in beekeeping. A functioning set up at the University will provide the education for those interested in beekeeping to set their own hive systems up at home to produce honey and bee-associated products. The bees also provide a pollination service in a very agricultural area such as Wagga. The CSU registered student club will establish three hives initially on campus as an information and skill sharing resource, which has the potential to act as a research resource. The purpose of this project is to consider innovative ways of engaging Ontario staff and student in cultivating sustainable personal and workplace practices through initiatives across campus. This will be achieved through environmental and personal audits, the results of which will be used to develop tangible short-term and long-term action items for Ontario students and staff to reduce their eco-footprint and develop a culture of sustainability on campus. Albury-Wodonga, Bathurst, Orange and Wagga Wagga campuses will each establish a residence as an 'Eco-Living Residence' as part of Residence Life accommodation a the commencement of 2014. This will provide the first example of theme living at CSU. 'Eco-Living' will gather like-minded students together to promote sustainable living within the CSU Halls of Residence. The project will increase awareness of sustainability principles and practices across all campuses, with the ability for growth and expansion in future years. Students will self-select to reside in the 'Eco-Living' themed housing. Each session has a focus; Focus area 1 to coincide with Session one on Energy usage: and Focus area 2 to coincide with Session two on waste. Seminars linked to sustainable living will be held in all Residential Precincts, allowing Eco-Living Residents to share the knowledge and experience to promote sustainable living across the student resident community, in line with Residential Support Scheme principles and with the support of Residence Life staff. A project hub, coordinated by the Convenor of the Course Directors Forum and involving a group of key stakeholders, and key focus groups will lead the development of a learning resource; Sustainability in the Professions. Sustainability in the Professions will be a teaching resource that can be meaningfully incorporated into a broad range of degrees and curricula across the University to support the implementation of the (incoming) graduate learning outcome regarding sustainability. The module will include generalised sustainability concepts and recognises that the concept of sustainability is contested. It will be enriched by specific case studies from a range of professions and across a range of workplaces. Stakeholders involved in the project will include Marion Tulloch, Executive Director, Division of Learning and Teaching Service and a number of businesses that typically employ our graduates. The resource will be developed as a series of separate modules allowing Course Directors and subject coordinators to: 1) contextualise the material in their own sustainability curricula; or 2) slot the appropriate resource/module into existing subjects; or 3) use it to develop new subjects around sustainability. There are four aims to this project through the EcoActive student club at the Wagga campus and include: to allow staff and students to access tools for bicycle maintenance and repair; to help students and staff gain ownership of a bike (sourced from tip-shop); to help students and staff learn how to use the tools to repair and maintain a bike (from trained staff and student volunteers); and to encourage staff and students to use bikes on and off campus through providing information and events. This project aims to improve the BDMS to meet the needs of different stakeholders to deploy University-wide. The BDMS is an electronic filing system to manage student files and support stakeholders by enabling the saving and retrieving of student information onto one University electronic centralised student file. Ability to meet litigation and FOI requirements more easily. This project capitalises on previous successful CSU Sustainability grants to highlight the benefits of sustainable practice, with specific reference to improvements in the natural environment. The project seeks to enhance existing initiatives including the wetland walking trails, touch-sensitive information kiosks, educative signage and habitat enhancement on the Albury-Wodonga campus by installing unobtrusive electronic monitoring equipment to capture the changes occurring on the campus as a result of these initiatives. By strategically placing the time-lapse and motion-sensitive cameras throughout the campus' natural environments, a greater understanding of the non-human inhabitants of the campus will be gained. Furthermore, such data provides evidence of the positive effect of a variety of sustainable initiatives that are embedded in the campus environment. Such data will provide opportunities for extensive research, enhanced teaching and student engagement with the campus, and collaboration with community groups. Moreover, this initiative allows for the full appreciation of the benefits of living sustainably. This project stems from the need to connect locations of ecological, environmental, cultural, historical and geological features across the Wagga campus. These connections already informally exist via pathways and trails. The addition of future formalised trails will create and further enhance the features of the campus grounds. These connections are consistent with the vision outlined in the Wagga Campus Master Plan. When completed, formalised connections will showcase the campus to CSU staff and students, and the wider community, in regards to the ability of the University to manage and ensure sustainability and biodiversity of the abiotic and biotic features within the landscape. This project with its unique ability to connect many different spaces will need explanation in a visual format. Through CSU Sustainability grant funding, interpretive signage will be installed at a possible twenty sites along the paths, walks and tracks that make up the route around the CSU Wagga campus. This project seeks to enhance sustainability literacy among CSU staff and students in an engaging and informative manner. Using social science research methodology, surveys and focus groups will be conducted to identify student and staff knowledge around issues of environmental sustainability, particularly associated with water, food, energy and recycling. Applying a mixed methods approach (qualitative & quantitative), we seek to unpack how various literacies, attitudes and behaviours developed to determine if increased literacy results in modified behaviours. Regionally relevant knowledge gaps identified through the survey and focus groups will be used to create an awareness campaign utilising a range of communication strategies, including a public lecture open to the local community. Results will be published in peer reviewed journals, provided to organisational change leaders, such as course and research directors, to help them address identified sustainability literacy gaps in curriculum, organisational behaviour and the community at large. Remnant vegetation on CSU farms provides a variety of production benefits and ecosystem services, including stock shelter and biological habitat. Much of this vegetation consists of single, isolated paddock trees. The health and long-term viability of these trees is subject to a range of threatening processes in an agricultural context. The aim of this project is to examine selected biological properties (i.e. terrestrial arthropods & soil properties) of the pasture and soil environment under randomly selected paddock trees and the surrounding pasture in order to identify any significant changes to these properties under the tree canopy, thereby identifying factors which may be affecting tree health. This information will then be used to make recommendations on soil and pasture management strategies that could improve tree health and longevity and enhance the contribution of these trees to sustaining farm production and the environment. This CSU Sustainability grant funding supports the development of a published peer reviewed paper. This project will investigate whether the CSU core generic competency of environmental sustainability that is embedded into all CSU curricula has an impact on undergraduate's understanding, knowledge and behaviour in relation to sustainability. This pilot project will survey all undergraduate students on the Albury-Wodonga campus using an online survey that has been previously used successfully by these researchers. Pre and post surveys will be undertaken with first, second and third year students at the beginning of the academic year (February 2014) and at the end of the academic year (October 2014) to determine change over time and across all student cohorts. In addition, all relevant documents relating to CSU courses and subjects taught on the campus will be subject to content analysis to identify where and how environmental sustainability is delivered to the students. This project will contribute to meeting the objectives in relation to providing and promoting environmental sustainability to all students in the University Strategy, CSU Environmental Sustainability Enabling Plan 2011-2015, Student Experience Plan 2011-2015 and the CSU Degree Initiative. This project aims to pro-socially model environmentally responsible global citizenship through carbon offsetting the international travel of a CSU Social Work facilitated, two week study abroad program. The project will promote sustainability in higher education, as per the Tailloires Declaration to which CSU is a signatory. The two-week study abroad program aims to offset the carbon footprint by tree-planting. Specifically the project will increase the environmental awareness of staff and students, and a commitment to environmentally responsible citizenship at the local and global levels. This project is a pilot to develop a strategy to increase good waste management practices within the residences at the Albury-Wodonga campus. The strategy will include education and appropriate facilities to maximise recycling and minimise contamination, thereby minimising CSU's carbon footprint. The overall aim of the project is to achieve behavioural change among residential students by implementing good education, good waste management facilities and useful visual guides. Thereby, reducing the volume of waste to landfill and the level of contamination in recycling. This project aims to achieve a cultural change among staff and students on the Bathurst campus through the interactive use of a stationary bicycle in the library to power personal electronic items. The HPBI also promotes a healthy workplace and campus for staff and students. The HBPI will provide an alternative reliable, clean, green source of energy to power personal electronic items such as iPods, mobile phones and laptops, in the 24 hour zone of the Bathurst Library. These items can be charged while increasing fitness, reducing costs and lowering carbon footprints. It is a fun way to bring energy efficiency education to CSU. This project will develop and deliver an accredited introductory sustainability program to staff, which covers the requirements of the Unit of Competency BSBSUS301A - implement and monitor environmentally sustainable work practices, from the Business Services Training Package. The program will include a two hour introductory workshop to establish the framework of sustainable practices both individually and in the workplace. Participants will be required to undertake pre-workshop activities and will be required to undertake a work-based sustainability project to demonstrate the application of their learning. This project aims to determine the motivations behind the current transport choices and behaviours of CSU staff and students who attend the Albury-Wodonga campus. Through an understanding of current transport behaviours, the outcomes of the project will provide a better understanding of the needs for sustainable transport options for staff and students in regional areas. It is in regional areas where there is usually limited access to public transport and often, longer commuting distances. This project will ultimately reduce carbon dioxide emissions and lead to more sustainable transport choices through education and engagement of staff and students in their commuting and inter campus travel. This project will involve the School of Education at the Wagga campus in planting an indigenous food garden around the SoE building under the guidance of local Indigenous groups. The use of the garden will be implemented in the curriculum, engaging staff, students and the community. The garden now around the SoE building is full of native and exotic flora species, with many areas of the garden sparsely vegetated. Native plants will be used on one side of the building to attract native birds to the garden. The remaining area around the building will be vegetated with indigenous food plants, increasing cultural education, biodiversity and the overall aesthetics of the garden. Signs promoting the cultural importance of the indigenous food garden will be used to engage and promote sustainability to the CSU and wider community. This project will develop the native Box Gum Grassy Woodland (BGGW) vegetation community corridors in paddocks 11 and 13, enhancing the biodiversity of the Equine Centre at the Wagga campus. The proposed corridors will improve the connectivity between existing BGGW corridors. The barbed-wire fencing will be replaced with high tensile plain wire around these paddocks, and the anticipated shade generated by the BGGW treeline, will improve animal welfare standards for the teaching animals (horses) and local native fauna. This project will develop a garden that engages the local multicultural and Indigenous groups within the Dubbo community with CSU. It will provide an outdoor teaching space on campus that can be used for sustainability, indigenous and cultural diversity learning and teaching. The project will connect the new sport and recreation facilities to the main campus buildings and assist CSU in reaching one of the sustainability targets by attributing 20% of CSU land to an increase in biodiversity by 2015 and to cooperate with communities towards sustainability. The Kerr Sustainability Centre is an organic vegetable garden, which began in April 2011. It is led by local community member Mark Trebley with the involvement of a large group of CSU students. The unused land was converted to a series of veggie gardens that engage the CSU and wider community by promoting sustainability through local organic produce. The long term use of the centre is for it to become a community hub of sustainability ideas through education, workshops, events and local organic food principles. The funding provided by the CSU Sustainability Grant program will assist in purchasing tools for the garden, to further promote its initiatives and increase community involvement. This project aims to develop the knowledge of the children attending the Murray Children's Centre of environmental sustainability through learning about bush tucker and bush walking. It is a community based project that aims to educate young children attending the Centre, their families and the citizens in the CSU and greater Thurgoona community about environmental knowledge, history of living off the land in regional NSW along the Murray River, and respect and responsibility for the health of the environment. Bush tucker planting beds will be created for infant, toddler, and preschool learning spaces, which will also assist in creating culturally meaningful outdoor climbing and imaginative play equipment made from locally sourced reclaimed and recycled natural materials. The play structures will reflect naturally occurring environmental elements in this region of NSW and to make connections which expand children's working knowledge of our environmental footprint. This project will explore the sustainability issues of importance to staff and students at CSU through the running of a Sustainability Film Festival. Students and staff will be invited to submit short films which highlight their concerns, suggestions and ideas of sustainability relating to their engagement with CSU. The winning entries will be exhibited through an online and on-campus Film Festival. A written and film synopsis of the project and submissions received will also be developed as a resource to help guide the strategic direction of sustainability initiatives at CSU, and market CSU's sustainability initiatives more broadly. This project is a pilot to replace the non-recyclable 12 and 16 oz take-away coffee cups currently sold at CSU catering outlets, with 100% biodegradable alternatives. The pilot will be across Food and Beverage Outlets at CSU's five main campuses (Albury-Wodonga, Bathurst, Dubbo, Orange and Wagga). A promotion and communication campaign will be run in parallel with the project, to raise awareness among consumers, with the intention of reducing the incidence of contamination of the co-mingled recycling stream. A formal assessment of the pilot will be completed, and recommendations made about the viability of extending the principles of the program to other packaging materials. This would include an assessment of the financial viability of covering the increased cost of using environmentally responsible packaging, through a change in the price point of relevant products. This project will involve the removal of barbed wire from approximately 10 km of priority fences across the Wagga campus. Barbed wire is problematic for native fauna, such as eastern grey kangaroos, flying foxes and squirrel gliders, as it can cause injury or death when animals attempt to cross the fence and become tangled in the barbs. This project will replace the barbed wire with plain, high-tensile wire. The two upper wires will also be spaced in a manner that reduces the propensity of animals to become tangled. All barbed wire that is removed will either be reused in suitable alternative applications, or recycled. The use of fauna friendly fencing will be ensured in the long-term through inclusion of the requirement in CSU Standard Operating Procedures and Fencing Policies. This project will involve the installation of three rainwater tanks adjacent to Building W9 at CSU's Bathurst Campus. The tanks will save an estimated 245,000 L of potable water every year, through the use of rainwater in the building's toilets and urinals, and for irrigation of lawn and garden areas adjacent to the building. The tanks will be installed in a prominent location, directly adjacent to Research Station Drive. Signage will further increase the prominence of the rainwater harvesting scheme, and create greater awareness among passing students, staff and visitors. This project aims to enhance the biodiversity of the Village Creek riparian zone, while rehabilitating and preventing further erosion. The area, located between John Oxley Village and the new residences on the Bathurst Campus, is currently overgrown with weeds and used as a refuse for student litter. The goal is to improve the visual amenity of this area by planting native shrubs, grasses and trees. The site will be prepared beforehand with logs placed as habitat and refuge. The lower part of the gully will be filled just above the road between the two villages to prevent further erosion. Involving students in the planting, maintenance and publicity of the project will educate students as well as creating cultural change in the way they treat the area, with the hope that they will take ownership of the area and take pride in looking after it. The project aims to take a collaborative approach, with broad community engagement through involvement of the Boundary Road Landcare Group, the Sustainability Manager for the Flannery Centre, the Jacques Park Group, Bathurst Regional Council and the Soil Conservation Service. The project will also be linked to projects in the upper and lower reaches of the Hawthornden Creek, to ensure an integrated, whole of catchment approach. This project aims to improve the management of the remnant forest and native grassland site on the western boundary of the Albury-Wodonga (Thurgoona) Campus. Due to the undulating topography, and the lack of fences and gates, the site is currently managed by chemical spraying and burn-offs, to control the significant fire risk presented by the site. Furthermore, construction of the new Childcare Centre will result in stormwater being directed at high speed through the remnant area, creating significant erosion issues. This project aims to realign gates and fences to enclose the area, and create swales to divert the overland flow to the dam, thus allowing the site to be managed by strategic grazing. The nearby rainwater tanks will also be plumbed into the swales, to top up the dam during dry seasons. The project will significantly reduce fire risk, minimise erosion, allow native grasses to re-establish, assist with weed control, and slow and clean the water before it passes into the main water course. This project will involve a vegetable garden and a social Community Hub space. The garden will provide vegetables for students, encouraging healthy eating and getting students, staff and the local community involved in educational garden activities. A rainwater tank will be connected, and a volunteer Garden Gang established to plant and maintain the garden. The Community Hub will provide a space for workshops, club meetings, club meetings and social events, where people can learn about sustainable issues and solutions, and work together to make their visions of a more connected and fulfilling future a reality. This project will develop a native shrub, grass and herbaceous legume nursery that will be used for tertiary and secondary education teaching purposes, to provide material for biodiversity plantings across the campus, to train local landscape managers and farmers on the range of native species available, and to develop a supply of seed for locally useful species in collaboration with the local Aboriginal community. Up to 60 different plant species will be grown under glasshouse conditions, and assessed for adaptation to abiotic stresses such as salinity, acidity and heat. A communication strategy will be developed, incorporating elements such as field days, information sheets and environmental education programs with local schools. The Grant will fund consumables and a new irrigation time management system at the Orange Campus horticultural centre to enable the propagation of approximately 1300 tube stock per year. These will then be planted in cooperation with local environmental groups such as Summer Creekcare to revegetate key areas of the catchment of the Summer Hill creek. The primary aims of this project are to improve land sustainability, protect creek banks from erosion, provide shelter for stock and to encourage the return of wildlife species known to be locally declining or listed as 'vulnerable' on the Threatened Species Conservation Act. The propagation group comprised of academic and general staff members sources seed through members' own harvesting in the local community, purchases from local nurseries and seed swaps from likeminded community groups and TAFE. Expansion of the successful composting program, which has been operating in St Martin's and in one of the blocks in New Residences, in order to reduce landfill, increase nitrogen through the University's composting program, and put composting into the psyche of students for life. Students will deposit organic materials from kitchens into convenient bins, which are then collected by a student who will be hired to deposit them in 400L compost bins near the student gardens. When these fill, DFM staff will transport the material to the campus compost site. This project will move the fence along the stretch of Hawthornden Creek on the southern side of Bathurst Campus in order to widen the area along the creek (the 'riparian zone') for rehabilitation. This project is part of a larger collaborative proposal with Bathurst Regional Council to rehabilitate this section of Hawthornden Creek, complementing work by Council and community groups up and down stream of the site. Moving the fence is an important step toward addressing invasive woody weeds, revegetating with native species and increasing available habitat for native fauna. From its conception, the development of the Albury-Wodonga campus has been driven by principles of sustainability. This project aims to set up two electronic environmental information kiosks to act as information portals. These kiosks would promote the environmental and sustainable initiatives on campus as well as providing information about the biodiversity on campus. The kiosks would provide staff, students and visitors with information concerning many aspects via interactive computer technology. The kiosk operates with a touch sensitive screen and can run a variety of programs that provide insights into many aspects of the campus's sustainability initiatives. embedding authentic, student-directed learning for sustainability in the science education subjects of the B. Education and B. Teaching programs. The David Mitchell Wetlands are an integral feature of the Albury/Wodonga campus and are of significant ecological value to the region. Over recent years the Wetlands have been increasingly used as a both a stimulus and site for learning and research for CSU and the wider community. As a result of pedestrian traffic, a series of pathways and tracks have been formally and informally established. There is a clear need to establish an accessible and safe walking trial around the wetlands. This project would see the development of a clearly defined track around the campus that would include educative signage and causeways. Signage would advise and educate people using the wetland on a range of issues including information on native flora and fauna and the functionality of the wetlands in regard to grey water management. This funding will support the Green Steps program being run at CSU for approximately 14 students who will be selected based on applications. Green Steps (of the Monash Sustainability Institute) has won three prestigious environmental awards within the last year: the Banksia Environmental Awards; the Victorian Premier's Sustainability Awards; and the 2010 World Environment Day Awards. Participating students learn skills in environmental auditing for an organisation, become immersed in a culture of acting on sustainability issues, gain experience (through an internship) in facilitating behaviour change and increase their job prospects. Applications will open later in 2010 with the 30 hour training being run in 2011, followed by internships for the students. This project aims to increase the frequency of environmentally responsible behaviour by people who use the Albury-Wodonga campus. The campus has an environmentally sensitive design that requires campus users to play an active role in its management. At present getting users to play an active role is limited to ad hoc tours and induction processes. A more systematic approach is required if campus users are to be better oriented and appreciate the design, and behave in ways consistent with the design. This project will place signage and other media in critical areas around the campus in order to create a unity of vision between campus design and user/visitor behaviour. In doing so, we aim to increase responsible environmental behaviours on campus. A secondary benefit is that we will also give visitors the opportunity to learn about sustainable design and how to apply this in other places. We will test this aim by monitoring some behaviours, in order to demonstrate behaviour change. This project involved changing the lights in the Performing Arts television studio (Wagga) to fixtures utilising 'cool lighting' fluorescent technology that consumes approximately 80% less power and generates 90% less heat than the tungsten lights previously used. The project successfully replaced the tungsten lighting, and around 80% of projects now utilise only the newly installed cool lighting. While a project would previously have required the use of more than 21,000 watts, a similar production now utilises only about 2,500 watts. An additional advantage resulting from the new technology is the fact that the entire grid can now be turned off remotely from the control room, with the push of a single button. This means that lighting is far more readily able to be turned off, thus reducing the operating time of the load. The reduction in heat output associated with the new lighting has also had a positive effect on energy use, through reduced air-conditioning requirements. Whilst expensive in initial outlay, this project has clearly reaped rewards in multiple areas. Students now have more flexibility, and are working with current technology, meaning operating practices are more in line with industry standards. The project has delivered real benefits to the University, our students, and the environment. The project involved the purchase and installation of a 22,700 L rainwater tank, and associated infrastructure, at the Transport Office on the Bathurst campus. Previously, vehicles in the University fleet were washed using water supplied from the city water supply, or using commercial facilities off campus. In the first year of operation (Dec 2009 to Dec 2010), the rainwater tank supplied 38,000 L of harvested water for washing vehicles. In addition, project staff purchased a high pressure wash unit. This has reduced the volume of water used to wash each vehicle to around 20 L, compared to the 100 L required to clean a vehicle using a hand held hose and broom. Transport staff have pro-actively communicated the project and its objectives to other members of the team, as well as to the wider University community. This project is an extension of recently completed work by Black, Davidson and Retra trialling methods to reduce student energy consumption in their on-campus residences. The social marketing tools in this project have been shown to result in up to 23% reduction in greenhouse gas production and up to 28% reduction in electricity use. We are recommending the installation of the most cost-effective tools: the social marketing tools (based on McKenzie-Mohr & Smith's approach, (1999) across similar residential cottages on four CSU campuses in 2010. This will involve the purchase of equipment, modification of information poster, installation and ongoing support, auditing of the program throughout 2010, and collection of student feedback. We are confident of a minimum of 13% reduction in greenhouse gases but expect that the reduction will be higher, up to 23%, greatly aiding CSU to reach its greenhouse gas neutral target by 2015. We also expect an electricity reduction of up to 28% that will assist in achieving the CSU target of 10% reduction in energy consumption by 2011. The aim of this project is to develop, trial and evaluate behaviour change strategies that will result in energy and greenhouse gas reduction among students living in the on-campus halls of residence at Thurgoona. The project, based on social marketing theory, assumes that different populations will have different barriers and perceived benefits to behaviour change. The project is an extension of recently completed work by Black, Davidson and Retra trialling methods to reduce student's energy consumption in the on-campus self-catering cottages on the Wagga Wagga campus and although both projects involve students the living situation and building types are quite different, therefore we cannot assume that the same types of tools will be appropriate for the students in the halls of residences. Focus groups will be conducted with the students to determine the barriers and benefits to behaviour change. Using this data we will develop social marketing tools specifically for this group. The tools will be implemented over 2010. At the end of the project feedback will be sought from the students through focus groups and an on-line survey. Base line electricity data will be collected prior to and at the end of the project to determine if electricity consumption has changed. In the recently completed study at Wagga Wagga the social marketing tools resulted in up to a 23% reduction in greenhouse gas production and up to 28% reduction in electricity, however reductions may be less for the halls of residences as sustainability features have been incorporated in their design. This project involved the development of a University-wide waste management education program and implementation of improved waste infrastructure (such as recycling bins and signage) in high waste-generating areas across all major CSU campuses. The project also involved a thorough waste audit at the Wagga Wagga Campus, to improve understanding of waste composition and highlight resource recovery opportunities. A comprehensive waste education campaign was also conducted, to assist staff and students to effectively utilise the new waste infrastructure. This campaign included the development of an online waste tutorial on the CSU Green website; prominent signage on display at the waste disposal points; and presentations to staff in key target areas (such as kitchens and student residences). There has already been a small increase in the proportion of waste recycled across CSU, and it is anticipated that further improvements will be observed as the project is fully implemented. This proposal has been developed in conjunction with academic staff, students, facilities management staff and student services and demonstrates broad support from many sections of the University. We propose to apply a participatory learning approach to the development of a sustainability garden integrated into the new student residences on the Thurgoona campus to address environmental, social and economic sustainability. The garden will combine the principles of organic food production, biodiversity, self-sufficiency, reduced greenhouse gas emissions and increased social outcomes through a community developed and run project. The high visibility project will incorporate residents, Student Services, DFM, the School of Environmental Sciences, Riverina TAFE and the wider community. The project will integrate current research being undertaken by staff of the School of Environmental Sciences on participatory learning practices. The longevity and durability of the project is enhanced because participatory learning techniques increase ownership of projects increasing the likelihood of success. This project was designed to motivate School of Education staff to reduce their energy use via individual metering devices. It also aimed to raise student awareness about the energy saving project being conducted in the School of Education, to hopefully flow on to encourage energy saving behaviour in students and within the education institutions in which they will ultimately work. Staff and research students in the School of Education were engaged to reduce the energy consumption of their computers and monitors, through a simple two week metering process. Seven inexpensive meters were installed on different volunteers' machines. Participants received information on their energy use, and two easy actions to reduce use after an initial week of monitoring. Energy savings during the project averaged 32% across the 30 participants. Through involvement in the project, and discussions about how energy reductions could be achieved, it is hoped that participants will continue to incorporate energy saving measures into their everyday work practices. The meters used in this project are now available for loan to any staff member.